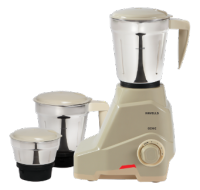 Havells Genie is a 1 litre jar capacity JMG can be used for multiple purposes. This white mixer grinder comes with a compact and sleek design that makes it easy to use and store. Enjoy quick food processing as it comes with hardened steel blades and operates with 500 W power. It comes with 3 stainless steel jars that can be best used for various processes. To Recieve updates and possible rewards for Havells Genie Green please sign in. To Recieve updates and possible rewards for Juicer Mixer Grinder (JMG) please sign in.